Keep your swimming pool clean, clear, and balanced with the professional pool services of Pool Medic! Test and balance chlorine, pH, stabilizers, calcium and alkalinity levels. Inspect and clean filters, tiles, and skimmer baskets. Vacuum the pool and skim the water surface. Add water to the pool when needed. Review and maintain electrical components of the system. Clean and inspect pool deck, tile and grout installations. Check drains, pool steps, and ladders. Coordinate landscaping and lawn care services in pool area. Pool Medic employs the use of Natural Chemistry, a natural, enzyme based cleaner that specializes in pool and spa maintenance. We provide premier pool maintenance services for primary, second home and rental property owners, as well as housing associations, management companies, and commercial businesses in the Surfside Beach, Garden City, Pawleys Island, Murrells Inlet, Socastee, Myrtle Beach, SC and surrounding area. Leak Detection, Pool Repairs & More! Think your may have a leak or your deck or concrete patio is looking drab? We can help with that too! 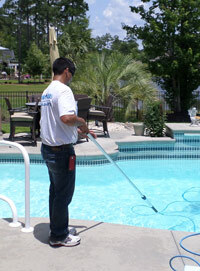 Pool Medic also offers complete pool repair and construction services.